Some people are intimidated by mess and see clutter as a deterrent. They let things pile up until their homes look like a scene out of a reality show. Others are simply too busy to clean. It’s understandable. You get home from work and the last thing you want to do is pick up strewn clothing from your teenager’s floor. Take it out and put it away. That’s it. Simple, right? When you use something, put it away when you’re done with it. 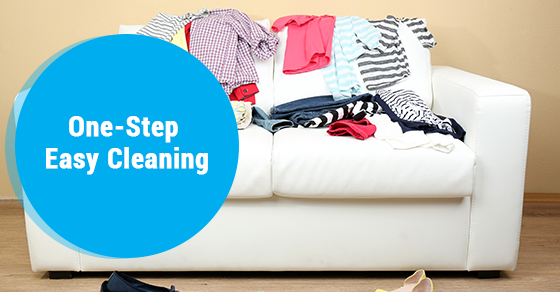 Instead of throwing dirty clothes on the floor, put them in the hamper straight away. Dirty dishes? They can go right in the dishwasher or take two minutes to wash them after a meal. Counter spills and crumbs? Wipe them up as soon as you see them. You’ll notice a cleaner house in no time. For bigger messes, grab two garbage bags and use this mantra: Throw it away or give it away. Start with your most cluttered room. One garbage bag is for things you will be donating; the other is for things you will be keeping. We all have stuff that we just don’t use or wear anymore. Instead of letting it build up, why not give it away? Kids outgrow clothing, fashions change, and sometimes we end up with extra dishware we don’t use. Most donation centres will take these things off your hands. All you have to do is find a centre that supports a cause you like. You can even deposit these items – especially clothing – in a donation bin (found mostly in grocery store parking lots). These mantras also work for your mail! Once you get a bill, take care of it and file it away. For newspapers and magazines, once you’re done reading them, put them in the recycling bin before they pile up. Junk mail? Who needs it?! It can go directly into recycling instead of sitting in a pile, cluttering up your valuable counter space. You can also switch to online billing to keep from receiving paper bills that you’ll ultimately end up recycling. Take it out and put it away. Throw it away or give it away. Remember these two sentences and your house will remain clutter-free! For those hard to reach places like the top of your fridge and light fixtures, hiring a professional cleaner will do the trick.